Your home is a lot like your car, if you don’t keep it clean then the paint may fail much faster than intended. Here’s a few tips to make sure your painting investment lasts as long as possible! 1) Pressure wash Once a year (Or every other year). 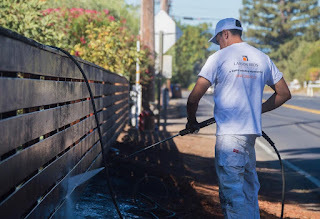 Have the house pressure washed once a year to clean off dirt building on the siding and trim. The longer the dirt stands there, the more harm it can do to the paint job. 3) Check Caulking and spackle. The old saying goes: “Caulking and spackle won’t hold the house together.” Keep up on the exterior caulking and take a quick look around the house once a year to see if any of the caulking or spackle has cracked. Caulking is elastic, but it can only stretch so far, and if your house is settling, it will probably crack the caulking in some areas. By keeping on top of the caulking on your home, you can prevent expensive projects that require dry rot replacement and prevenet water damage. If your looking for a good caulking to use, we suggest using DAP Powerpoint 230, or “Big Stretch” caulking. Once a year, have touch ups done over areas that get more sun, and over the places that tend to settle more. If you do make any additions, or add new wood anywhere, make sure that it’s primed and painted right away to seal it from moisture. There should not be any bare wood on your home. If you add in a deck or railing, seal it right away (Well, not right away, with new wood, you generally want to wait a few weeks for the wood to off gas before staining), but once it has sat for the lumber providers specified time frame, seal it. If you want to keep the bare wood look, use a “natural stain”. This won’t add any color to the wood. Extra Note for homes: If you own an older home, go easy with the pressure washer to make sure you don't disturb the older layers of paint and you may want to check the house 2 times a year for any issues or movement because older homes tend to have more maintenance.